Jarrod Dyson of the Kansas City Royals at bat in the third inning of Game 4 of the 2014 World Series at AT&T Park in San Francisco. After a miracle postseason run, the Kansas City Royals’ quest for their first World Series championship since 1985 looks shaky. Combining Baseball-Reference.com’s in-game win probability model with the series win probability numbers I computed for a post on Friday, we can track the odds of each team winning the series at any point within any game thus far. In the top of the third inning of Game 4, the Royals tagged San Francisco Giants starting pitcher Ryan Vogelsong for four runs, opening up a 4-1 lead. As a result, Giants manager Bruce Bochy was forced to bring in reliever Jean Machi from the bullpen early, and Machi promptly walked Jarrod Dyson to load the bases. At that precise juncture — with the bases loaded and two outs in the third inning, leading the game 4-1 and the series 2-1 — the Royals had an 82.4 percent probability of winning the World Series. Machi eventually got out of the jam, and San Francisco cut the lead to 4-2 in the bottom of the third. But two innings later, the Royals again cracked an 82 percent World Series win probability when Eric Hosmer led off the fifth inning with a double. The odds of scoring at least one run are fairly high with a runner on second base and nobody out, and a three-run lead in the fifth inning would have given Kansas City a better than 80 percent chance of winning the game. With a 3-1 series lead and two of the remaining three games (if necessary) at home, the Royals would have had an 88.5 percent probability of winning the World Series. But they failed to score Hosmer in the fifth, then let the Giants tie the game in the bottom of the inning. An inning later, San Francisco blew the game open with three runs, then tacked on four more in the seventh en route to an 11-4 victory. We may eventually look back at those two moments of Game 4 as the high-water marks for Kansas City’s World Series chances. 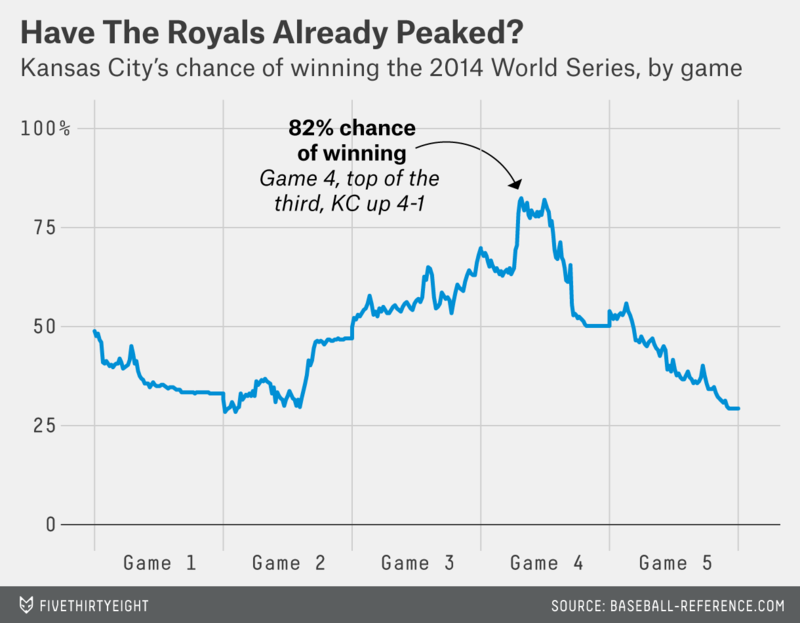 From the latter point on, the Royals have hemorrhaged win probability. Once tied at two games apiece, the series was almost a 50-50 proposition after taking into account where the remaining games were being played and who was taking the mound for each team. Kansas City still could have pushed its World Series win probability to 78.5 percent with a win Sunday night, but the Royals once again struggled to solve San Francisco’s Madison Bumgarner, and their odds of winning the series dropped almost linearly from 50.2 percent at the first pitch to 29.3 percent at the final out (just about where they stood after losing Game 1).